As a cultural center for Chicago’s Hispanic population, the Pilsen neighborhood has undergone considerable change in recent years. Among the most significant forces for change has been the local alderman who has worked to establish the neighborhood as a historic district to provide tax breaks to Pilsen homeowners. 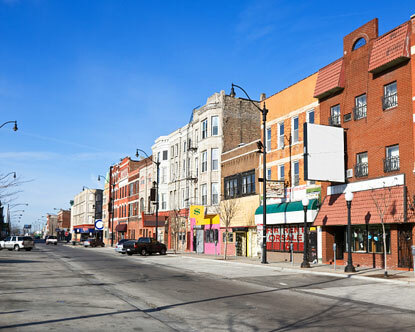 Likewise, Pilsen has seen considerable activity in the way of rehabs and new construction of condos and multi-units which has increased the attractiveness of the area to investors. Renovated and newly constructed condos tend to be more expensive than neighboring single family homes, but are a value when considering overall size and charm. The average price for a one-bedroom condo or loft in this Chicago neighborhood is $215,000, while the average price for a two-bedroom unit runs around $285,000. Single family homes with two bedrooms can sell for around $220,000, while large units of three to five bedrooms can be fetched in the low to mid $200,000s. Overall, the neighborhood has a distinct character with modern and cultural art galleries, historic churches, street food, and museums. German and Irish railroad workers first settled this neighborhood in the mid 18 hundreds but the neighborhood name comes from following generations of Czech restaurant owners that came to the area in the early 20th century. The neighborhood is now predominantly Hispanic with a growing diversity in population of artists and young professionals living and working along 18th street – the main artery – and its peripheries. Street art dots the neighborhood homes, stores, and public buildings leading up to the National Museum of Mexican art located east of Ashland in Harrison Park. Among other amenities such as tennis courts and baseball diamonds, Harrison Park also boasts a Chicago Park District Olympic-sized swimming pool open to the public during flexible hours for lap and family swims. Overall, Pilsen is dominated by young families with children along with a growing art community and nightlife located west of Racine Avenue, with the most recent addition to the array of local neighborhood bars, the Honky Tonk Grill. The Honky Tonk is a well-established BBQ restaurant that just recently opened a new saloon style pub, featuring local musicians on weeknights and weekends. Other noteworthy establishments include Kristoffer’s Café & Bakery and the Jumping Bean Café located kitty corner from the Rudy Lozano library at intersection of Blue Island Avenue and Racine Avenue.